What do you do on a grey autumn afternoon in London? You can spend the day fighting through the hoards on Regent Street, Oxford Street, or one of the shopping malls, getting more and more frazzled and dispirited. Or you could visit one of the free museums, and soak up some culture with your crowds. Or, you could say "Sod it!" and go on a cake crawl. Which is like a pub crawl, only with a lot less beer, and a lot more sugar. The plan? 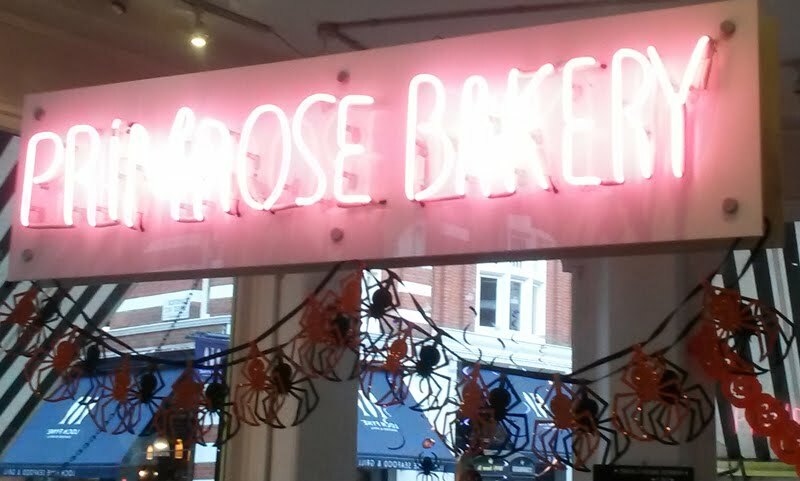 Hit up 5 bakeries and desert places in a cross-London odyssey, accompanied by my partner-in-face-stuffing Katie. The rules? Drink lots of tea, and pace yourself. This amount of sugar will separate the women from the girls. 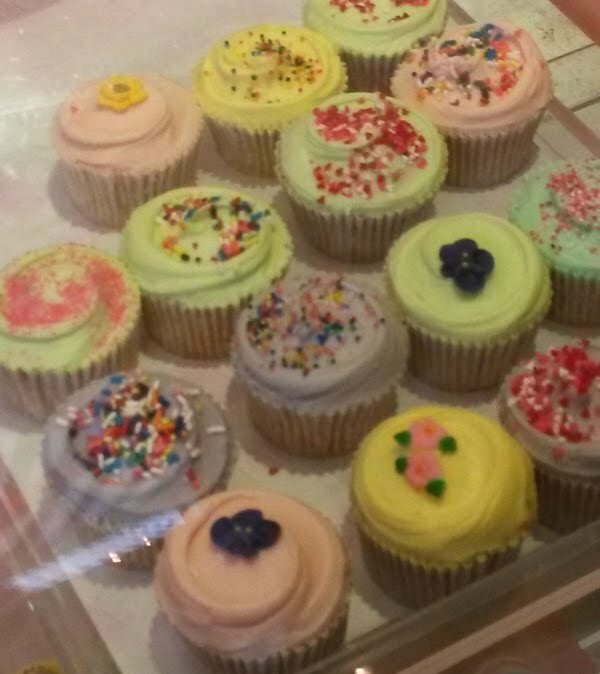 Pretty as a picture, the cupcakes in this tiny cafe / shop come in a wide range of girly flavours. Passion fruit, blueberry, rosewater and pistachio, chocolate mint. Plenty of the flavours are also available in mini sizes, useful for when you'd planned to share, but your companion is disinclined towards your choice of flavours. I should say here that I've never understood the current fascination with cupcakes. Too often, cupcakes are nothing but dry rounds of plain cake, covered in enough overly-sweet buttercream swirls to give a bunny diabetes. What's wrong with a full-sized cake, where a larger baking volume reduces the odds of drying out, and then slicing and icing layers delivers an optimal cake-to-frosting ratio? Why mess with a classic? 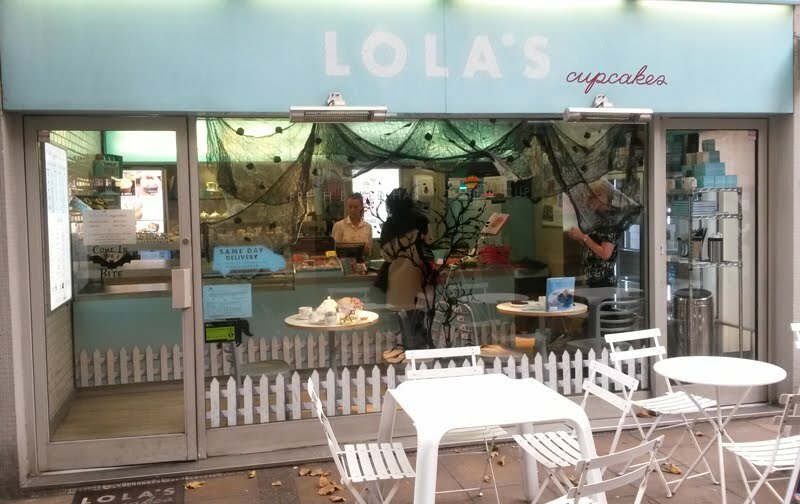 But at Lola's, like at many other bakeries these days, cupcakes dominate the menu, so cupcakes are what we ordered. I had the mini version of the rosewater and pistachio cupcakes, accompanied by a pot of tea. The cake was pleasant enough although slightly dry, with a strong flavour of rosewater emanating from the so-sweet icing, but not any discernible taste of pistachios (apart from a few pieces scattered on top as decoration). Overall, a nice enough place to stop for a sweet, but not setting the world on fire. How do I feel after eating? : My stomach is primed, I'm ready for stop 2. Now this is impressive. 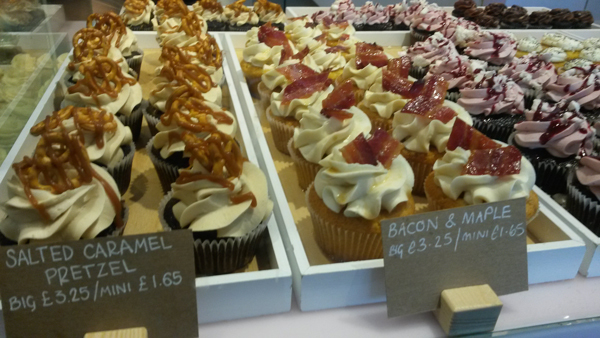 This popular, small shop offers a range of trendy and innovative flavours - salted caramel pretzel, maple and bacon, key lime pie. Making a decision here was hard - I wanted them all. Finally, my partner-in-face-stuffing and I settled on sharing a large slab of fudgy chocolate cake, topped with salted pretzels. The icing was quite thin on the ground but sweet and had a nice, creamy texture. But the standout was the cake itself - so moist that the icing was barely necessary. This could have been a masterclass in how to avoid dryness. Moist and fudgy cake, creamy and sweet icing, salty pretzels. Honey, I'm home! How do I feel after eating? : I really hate to admit this, but after one mini cupcake and half a big slice, I'm starting to feel sugared out already. I'm starting to wonder if I'm going to fail. I'm weak. I'm pathetic. Yauatcha came on the London trendy dining scene a few years back, making a big splash with their Michelin starred dim-sum and their weirdly French patisserie menu (matcha yuzu macarons anyone?). Feeling we desperately needed a break from the sugar, we stopped into Yauatcha for some dim sum, with the plan to follow with a few macarons, once we'd recovered from our sugar OD. I don't think I've ever eaten in a Michelin starred restaurant before, so wasn't certain what to expect - what makes a place star worthy? What does a star mean? 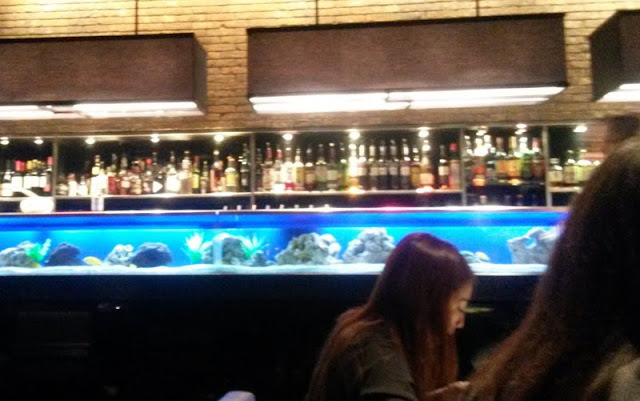 As far as I can tell, it means a random and redundant fish tank running the length of the bar, a downstairs interior so dark you could pretend you were in a cave, and no mirrors in toilets (as we're now above such shallow concerns). Many of the staff were also surprisingly badly trained for a restaurant of this caliber. I suspect some of the quite pretty young waiters were hired more for ambiance than ability. Dark wood, gilt and mirrored bar, redundant fish tank.... I guess that's what impresses "the book"
We'd only planned to share a pot of green tea and one or two dishes of dim sum (this was supposed to be a snack, not a full meal), but I got over-excited at their extensive menu, and ordered a bit more than intended. 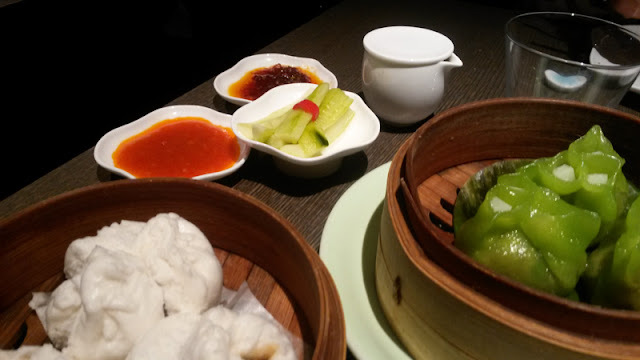 Wild mushroom dumplings (£5.20), from their steamed selection, featured a well-textured thin green skin, wrapped around a forgettable filling. These supposedly contain three different types of mushrooms, but to be honest I found them disappointingly a bit bland. Char sui buns (£4.80), however, do this classic staple proud. This isn't a dish I normally order, as I find char sui buns can be a little boring, but the friend I was eating with was practically a dim sum virgin, and wanted to try them. I was pleasantly surprised at how much I enjoyed these. Imagine crisp pastry that dissolves on your tongue like spun sugar. Imagine a decadently rich, sweet and unami-filled meaty inside, one that will make your ears jealous that your mouth is having all the fun. Imagine dim sum, but made by Jesus. I'll eat these again. As soon as possible. In fact, can I have some more now? Too full to order desert (although they did look mighty-purdy), and thoroughly stuffed with tea, dim sum and cake. we decide to walk to our next destination and see if we can face more sugar by then. This tiny and touristy shop was too busy to even get in the door, five people deep. We beat a hasty retreat. There's still some of plucky blitz spirit left in me, the unwillingness to admit defeat. So I drag Katie (by now becoming a bit of a reluctant participant in this sugar-driven forced march) to the final stop on my planned odyssey. Primrose Bakery is another one of the "new breed" of bakeries, offering mostly cupcakes. If I'm honest, the cupcakes look a bit ordinary after Crumbs and Doilies - flavours are your standard classics: red velvet, vanilla, choc, salted caramel, carrot. It goes against my very nature to admit this, but I'm just not tempted. Katie looks at me. I look at her. The acceptance is clear on both our faces. We can't do it. We're sugared out. We're officially too full to eat cake. We admit defeat, and trundle off towards our respective homes after agreeing that we should do this again soon. A stuffed, waddling, sugar-laden and oh, so very happy, failure. London has seen a trendiness of walking cake tours in recent times. There's even a bus cake tour, for those determined to not burn off ANY of the excess calories. These are certainly one way to experience a range of London bakeries, and usually stop at places that offer mini cakes or taster-sized portions, to help avoid the dreaded sugar overload. These tours are not cheap, however - expect to pay £40+ pp. 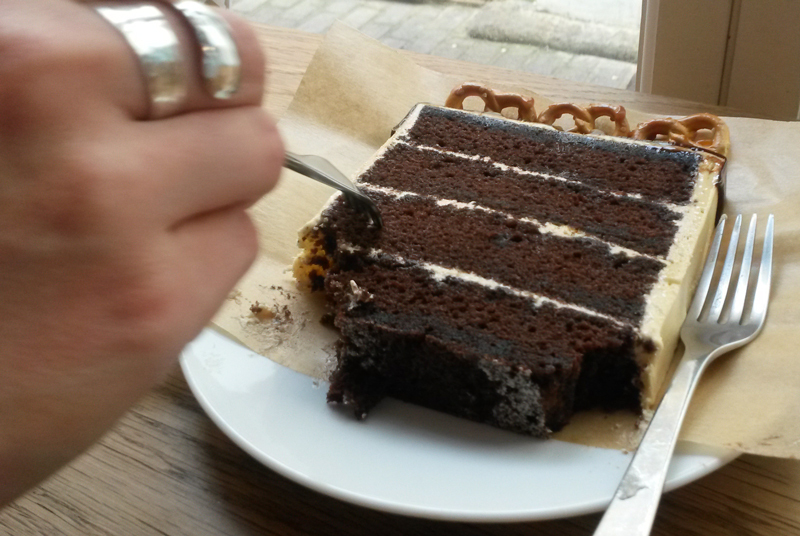 But with a good map and a little will, it's easy (and considerably cheaper) to organise your own cake crawl. A final note: please forgive the low quality pictures in this post. I neglected to take my main camera with me, so these photos were all taken on my cheap(ish) phone. Plus I feel like such a doofus taking faffing about taking pictures of my food in public that I tend to rush through it (especially when the food might be getting cold, and I'm really eager to start eating).